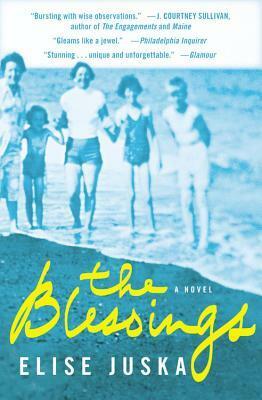 Today we welcome author Elise Juska as she discusses her novel The Blessings. It looks like it would make a great book to read over Thanksgiving. How did you come up with the characters for this novel? Is THE BLESSINGS in any way autobiographical? In some ways, yes. I grew up in a large, close extended family based in Northeast Philadelphia, so the rhythms and dynamics of that kind of family—lots of first cousins, lots of well-worn traditions—are very familiar to me. The central loss in the Blessing family, the death of a young uncle, resonates for me personally too. In my family, two uncles died quite young; both left behind small children. So that particular absence—and the way the family shifts to accommodate it—is one that has shaped my own family over time, and something I've tried to write about for years. Thinking about specific characters and considering from whose points of view to tell the story, I was conscious of exploring different facets of big family life. None of the characters is strictly autobiographical, but some are inflected by members of my own family. Helen was influenced to some degree by my grandmother. Abby, the college-bound niece in the opening chapter, is me-like. Others, like the troubled nephew Stephen, are completely fictional (though my real-life male cousins are now routinely asked: “are you the bad kid?”). What are you working on now? Where did the idea come from? The new novel originated in a specific moment, watching the news after the 2007 shooting at Virginia Tech. I was watching an interview with an English professor who had taught the shooter and tried to alert authorities to the violent material in his work. As a teacher myself—I’ve taught creative writing at the college level for about twenty years—I've long been afraid of this scenario: a student writes a troubling paper, that trouble goes undetected, and something terrible happens. It’s a fear I imagine many teachers—especially writing teachers, especially in this contemporary moment—can relate to, and a story I feel compelled to write. In the novel’s opening pages, an English professor learns that the gunman in a shooting at her local mall is her former student. From there, the story traces the ripple effect of this event on the teacher and her family after she digs up an old essay by this student and discovers hints of his violent nature that she may have missed. How has teaching writing informed your own work? One of the things I value about teaching writing is that it gives me the opportunity to articulate what I believe about fiction, what I love about fiction, then go back to my own desk and try to live up to those ideals. In that way, to teach is to constantly remind myself what matters most to me about what I do and why I do it. More specifically, and recently, there’s a simple prompt I sometimes offer my beginning writing students if they’re stuck for story ideas, which is to just ask the question: "what if?" Take some kernel of fear or guilt, some small true observation or experience, and ask: what if it were bigger? more meaningful? more irrevocable? See what happens if you exploit it, enlarge it, give it more weight. I wasn’t thinking consciously of this when I started my new novel, but in hindsight, I feel that I applied the "what if?" treatment to one of my own fears. What is your writing process like? How do you find the time? I’ve always been a disciplined writer, though it doesn’t feel like discipline to me; writing is the thing I’ve always most wanted to be doing. During the academic year (I direct the undergraduate Creative Writing program at the University of the Arts in Philadelphia) I tend to focus on revising, then devote summers to generating new work. For the last ten years or so, I’ve spent those summers up in Maine, alone, writing in a little cottage in the woods. I like to write early in the morning before the rest of the world is awake, and keep at it for as many hours as the day allows. Since the birth of my son eight months ago, my schedule is quite different, but I’ve learned a few things about myself as a writer: I’m more flexible about my writing conditions than I imagined; given less time to write, I’m actually even more focused while doing it; and it is possible to work on a novel by reaching across a sleeping baby and typing on a laptop propped on one’s knees. Do you have any recommendations of recent novels you particularly enjoyed? I just devoured the new Anne Enright, The Green Road, about a complicated Irish family. Enright’s novels feel so lived in, the sentences so graceful and lovely yet unsentimental and sometimes devastating at the same time. Staying with the complicated-family theme, I also recently enjoyed Maile Meloy’s Liars and Saints and Akhil Sharma’s Family Life.